200 years ago, we created a new society, with industry as the motor of progress. But despite the great strides we have taken, our modern economic system is running out of steam. This is mainly because we failed to foresee that our planet is only so big, that it has limited resources. 200 years ago we couldn’t have known this; but this has led us to the environmental, economical and social crisis that we see around us today. We already know what we need to know about the state of our world and our planet. It is time, now, to react, to transform this crisis into an opportunity to invent a new future. As specialists and lovers of the Ocean, we firmly believe that a major part of the solution will come from the sea. Because the Ocean covers almost three-quarters of the surface of the globe. It is bordered by around 550 000 km of coastline, it has been the cradle of life on Earth and all the planet’s natural equilibrium depend on it. It is home to millions of species, from micro-organisms to whales, it provides mineral and living resources that are vital to humanity, it regulates the climate and contributes to the water cycle; it produces half the oxygen of the air we breathe and it recycles nutrients. Ocean is the final frontier for exploration and discovery and the possibilities it offers to humanity are only limited by our imagination. Renewable energy from the ocean’s waves and currents, or even a hybrid sailing vessel using the rise and fall of the ocean swell for propulsion. Imagine microalgae bioreactors extracting atmospheric CO2, and transforming it in mineral carbon. Picture a global network of protected marine areas restocking the ocean, feeding humanity and supporting sustainable, yet profitable tourist activities. Imagine coral reefs acting as natural breakwaters and protecting coasts and imagine vast expanses of coastal marshlands cleansing and recycling water. Imagine, too, an aquaculture free at last from the limits of natural resources, providing consumers with abundant seafood, in a sustainable way. Think about all the substances recently discovered in marine organisms and which, in the future, will be used to fight against disease. Imagine all these benefits as part of sustainable and prosperous new economies, generating millions of jobs and distributed equitably across our planet. Then, you will have imagined the Blue Society. The Blue Society means believing in the immense potential of the oceans and in the opportunities they offer us to improve our lives. 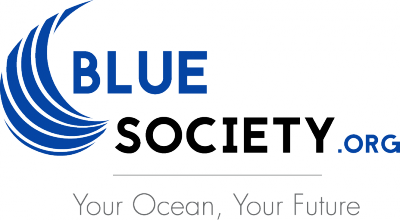 The Blue Society means using the ocean without diminishing its resources. It means believing in our power, to imagine, to create and to innovate; it means believing in learning from each other and it means believing in sustainable development. It means believing in fairness, in a leading role for citizens and in a shared way of thinking. It means believing in a Blue Society. It means believing in Oceankind. It means that we have to implement efficient governance in which all the parties can intervene. Finally, it means believing once again in innovation and creativity from human beings. Let us not waste this chance of re-creating the world we need. Let us believe again in progress and prosperity for everyone. If somebody tells you it’s unrealistic, please, tell him that it’s those who think that we can go on as we currently live who are unrealistic. Support the Blue Society. Sign the charter !